Consider the following points when you decide how to get everyone on board with the group’s purpose and identity. 1. Don’t be too quick to dismiss this person. They may have an important perspective that needs to be considered but the group is avoiding. Does their point of view actually expose a bigger way to think about your work? For instance, some people automatically go to worst-case-scenario thinking when confronted with a new situation. This can seem negative to people who are enthusiastic about the idea. But the different point of view might help to anticipate problems and consider options that will improve the result. Or they might be the source of valuable information about what’s working and not working in the group. Find out what their point of view is. Have they been heard? Are there any old unresolved issues that keep them from feeling a part of things? 2. Have a powerful inspiration event in your group. Have you recently reviewed your inspiration as a group? Is everyone in the same conversation about what you are committed to? Is it clear and unambiguous? A visioning or renewal event is an opportunity to draw everyone more deeply into something that they can care about and commit to. Be sure to take time to help everyone explore their personal inspiration and how that connects with the group. Speaking with them individually might be important. And the power of the group conversation that allows everyone to define their role in the group in together can create a big shift in the level of responsibility people feel to each other and the group’s cause. The so-called “difficult” person might become your biggest champion. A breakdown, or what some call a “difficult person,” can be a valuable opportunity to create a stronger culture that truly encourages, supports and rewards commitment to your vision and responsibility for your success. You will strengthen the group’s confidence in itself and your core values will be renewed. Paying attention to this and handling it well is one of the best things you can do for everyone – and for the results you want to create. I will address this further in the next post. When speaking to a group of small business owners last week I was reminded of how much struggle and frustration people experience at work. I began the workshop by asking people to describe their experiences of groups that they work in. They used words like “no communication, competition, backbiting, lack of leadership, mediocrity, frustration, disappointment” for struggling groups. The costs from this are high – results suffer because people withdraw, not sharing ideas, not getting a sense of accomplishment. And they talked about how they take that stress home; these negative experiences affect our families and our health. I’m betting you can relate to both of these kinds of experiences. I know I can. Yet, if we know what success looks like, why don’t we achieve that more often? Why so much suffering? Struggle Doesn’t Mean You’re a Failure. I believe it’s because we aren’t always sure what to do to create success – in all situations – consistently and reliably. Mostly we’re doing our best with good intentions, but without a road map or the proper tools for making it work. We hope that other “good” people come together with good intentions and that it will all work well. All we have to rely on is what we’ve learned – and whatever others bring from their own experience. Sometimes that is fine. We have that success described above. But more often, it’s not enough. We’re inevitably going to run up against occasional conflicts between our personal preferences and desires and those of others. That’s life right? It can be difficult enough when we are with people we love. But when we are thrown together with people we barely know in high-stakes situations such as at work, it can be a real ordeal. Especially when differences in backgrounds and styles are substantial. My own struggle led me to search for the formula for creating successful work systems. And now that I’ve studied this question for thirty years I’m quite sure that we can create high-quality relationships while producing great results in the world. It’s not just a matter of chance or of particular personalities who happen to be in the group. It’s a matter of context – the culture in the group. That’s where the permission, or acceptance, or tolerance of behavior comes from. That’s where the agreements, standards and expectations for how people will act and treat others come from. The quiet suffering that so many people go through at work is a symptom of the lack of open communication and intentionality in creating the group and its culture – together. The key is to learn about what works to bridge the gap between differences in backgrounds, perspectives and personal styles. Try new approaches to holding meetings, solving problems, making decisions, and talking about what really matters. Engage with each other more intentionally – take a bit of time to create the habits that keep communication open – even when it’s touchy. Take some time to create routine ways to keep inspiring each other with what you want to create in the world. Establish routines for assessing what is working and what is not so that you all get to recreate how best to achieve the goals that you all have committed to. Keep learning and exploring. Whatever approach you choose to help you to create more intentional relationships in your work, you can rest assured that your efforts will be rewarded. There is untapped wisdom and talent in every group. I know this because it is a fact that the power of group is emergent. It grows as the communication and accomplishments grow. You can grab a hold of that potential when you set the quality of your group as a priority. You will be able to accomplish more than you had imagined possible, and you will have a great experience doing it. Cheers to enjoying more camaraderie, momentum, great results, and fulfillment. Showing that you appreciate someone for what they contribute to you or your work is more than just a nice thing to do. It is also inspiring the future. Who doesn’t want to be genuinely acknowledged for doing well? It naturally encourages us to do more of that. That’s partly thanks to those brain chemicals like endorphins that get released in those moments. We want more! It’s psychologically powerful. Daniel Pink wrote a book called Drive that shows how strongly motivated people are by the intrinsic rewards of work and that the focus on money and material rewards can be overdone. Don’t get me wrong, no one is saying money isn’t important. We all deserve to be rewarded well financially. But it’s clearly not the only motivator or we wouldn’t have artists and musicians struggling with day jobs to support their passion. The intrinsic value of the activity looms large. Part of that intrinsic worth is the connection to our own personal values and the connection with people who share those values. We get to experience them physically and emotionally when they acknowledge us for what we are doing. Culturally speaking the feedback that acknowledgment and appreciation provides helps to reinforce the group’s values and encourage the behaviors and habits that support them. When your appreciation is specific to your group’s mission and goals then you are continually building the culture in your group that supports them. When you make an effort to acknowledge the way in which people are keeping the agreements they committed to, you are strengthening those agreements and making them worth more. Acknowledgment needs to be routine and present throughout your organization. That is what builds a strong culture grounded in what people value most. This cannot be manipulated to get results from people. We’re all savvy to insincere compliments and manipulation. But when it is sincere and heartfelt, acknowledging others for how they have furthered your mission and the well-being of your group will serve everyone well. Expressing happy thoughts relieves stress and creates positive brain chemistry for both the giver and the receiver. Share some of the feel good chemicals with your coworkers today and watch your results improve. 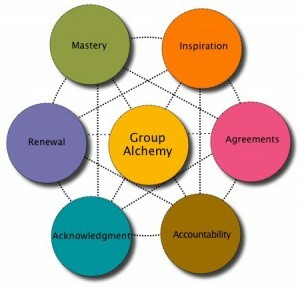 Group Alchemy® is a comprehensive method for establishing a collaborative culture in any group. Applying this formula ensures that your group stays inspired, efficient and productive. The staff meeting began with the senior vice president saying “Someone has to be held accountable for this mess. What the hell happened?” I could feel everyone in the room shrink back. The room was very quiet for a long moment. The tone of the manager’s question made it clear that he was looking for someone to blame. I knew that he had been in a very tense meeting with the board of directors the evening before. He had described it to me as feeling “grilled” and he was not happy about it. I cringed in that moment because I could see the damage that was being done to the group and I saw the power of accountability slipping away. I don’t think this manager meant for that to happen, but he appeared to be at a loss for how to get at accountability without confusing it with blame. Some version of this story happens often in groups. It’s understandable – most of us have these intertwined – but it undermines the power of the group effort. A couple of key distinctions can begin to transform how accountability works in your group. Accountability is simply an agreement to answer, or to “account,” for our actions. This means we are reporting accurately what we did and what the effects were. This is far from the notion of blame. The word blame actually derives from old Latin (blasphemere) that includes “reproach” and “revile.” I think its easy to say that these sentiments will hardly improve performance; rather they will halt progress in a flash. If an accounting indicates that someone didn’t do what she said she would do, then its a problem of integrity or commitment. Some people do not care about acting responsibly. If that is the case, then they need to go. But that’s not usually what happens. Most people are doing the best they can to do the right thing and still sometimes things don’t work out. Those are the situations where we need powerful accountability. Blame causes people to hide or avoid the truth and then learning stops. Removing blame, even when something goes wrong or differently than expected creates open and honest communication for true organizational learning to occur. You can assess what worked, what didn’t work, and how to improve. You can make valuable course corrections that make the difference between success and failure. Accountability and the personal integrity that it requires are easier to sustain when you have the elements of group alchemy in place. If you are struggling with accountability it might actually be inspiration or agreements that need attention. If you haven’t had that conversation about the inspiration for your group or partnership that makes your shared goals explicit then inspiration is the place to start. It is commitment to our inspiration that invites us to be deeply honest about how we are doing. Remember that explicit agreements are the key to working together. We are accountable for what we have committed or agreed to. Are your agreements specific with accountability measures built in so that everyone is operating from the same understanding? It’s easy to look for someone to blame when we are frustrated or angry that something didn’t go the way we expected. In fact, research indicates that it’s the brain’s automatic reaction when something goes wrong. But we don’t have to be stuck there. If you want more accountability in your group, your business, or your partnership, start by learning to recognize blame and move into learning. Take the time to acknowledge your disappointment, frustration, anger – whatever the feelings are. Then get curious. What happened? Was the plan clear? Did someone misunderstand? Did you have the right resources? Did you have clear agreements in place? When you do these things you will create shared ownership for results in your group and accountability will be embraced as a way to achieve the excellence and success that everyone wants. Anytime a group of people interact routinely, they develop agreements about how things are going to be done. Agreements create structure for your relationships and determine how you work together. For example, your job title and description is an agreement you are in with the organization you work in. That kind of agreement is explicit and obvious. You are also working within agreements about how everyone is going to behave. Many of these are less obvious and usually are not spoken explicitly. These are about things like how formal you should be, how much joking and kidding around is ok, or whether you talk openly about things that are uncomfortable. In social science we call these “norms” – the unspoken rules of the game. I call them agreements in order to call attention to the fact that when we go along we are “acting in accordance” – the very definition of agreement. These kind of unspoken agreements are often the most important ones for what actually happens between people. When we see that we can choose to be more intentional. The key to moving the group to a higher level of success is to become aware of the agreements that are driving what happens so we can make sure that they serve our goals. For example, is there an unspoken agreement that it’s ok to use smart phones during meetings? If so, does that serve your intended outcomes? Sometimes it might, sometimes it might not. Wouldn’t it help to make a clear agreement about that? Another common hidden agreement is that it doesn’t really matter if you miss a deadline. This can be a success killer. Efficiency and productivity suffer. Morale falls as confidence in each other. One of the most powerful things you can do to improve the level and quality of results in your group is to get a reign on the hidden agreements at play and put explicit, strong agreements in their place. Then you’ll have everyone working in concert and knowing what they can count on from each other. We all know how much that improves the quality of results. Be on the lookout for hidden agreements. When an explicit agreement is broken and that is not repaired, another agreement develops. The example of the missing deadlines illustrates this. Learn to notice when you are acting in accordance with something that has not been intentionally established to support results. Review all your agreements, explicit and hidden. Determine whether they are truly serving your inspired mission and goals or have you fallen into them without realizing how they are affecting your success. Wherever there is confusion or multiple ideas about what is supposed to happen you have a lack of agreement. Make ones that work for you. Replace hidden agreements with explicit ones that everyone can be accountable for. Such clarity and intention in our agreements makes full accountability possible. Without such clarity it is as though you’re all playing your own game. We’ll explore that in more depth next month. Welcome to the Group Alchemy Blog! Thanks for joining us! This is the place for people who want to work in more productive and satisfying groups. We will be exploring all topics related to powerful groups and look forward to building a community of people who are working on new ways of working and leading together. Please share your experiences – what works and what doesn’t – so we all can learn from you. Wishing you group alchemy.